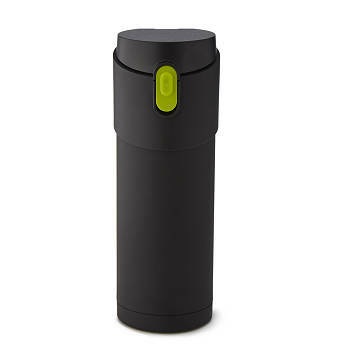 This ingenious filtered mug lets on-the-go tea lovers steep loose-leaf brews just the way they like them. This ingenious mug gives on-the-go tea lovers the convenience of tea bags, with loose leaf taste. Choose the steeping mode that's best for the tea you're using. For a controlled infusion, put the tea leaves in the lid's strainer compartment. For continuous infusion, drop them directly into the mug. Double-walled stainless steel insulation maintains the contents' temperature—hot or cold—for about six hours. Leak-free, you can pack it in a pocket, purse, or backpack, and never have to compromise on your cuppa. Made in China. 8" H x 3" Dia. Wash the tea maker and the lid in warm water using a non-abrasive sponge and mild dish detergent. Handwash only.